PANAMA CANAL EXPANSION: It spurred shipping lines to upgrade ships on that route. Container shipments from Asia to the US East and Gulf coasts grew 7.9 percent in 2017, vs. 1.3 percent to West Coast. The East/Gulf ports increased their transpacific market share last year to 34.4 percent. The shift in coastal balance eastward has been a constant trend in the past five years. Demand growth in 2017 was king on the Asia-US East Coast trade, where spot rates have recovered in the past few weeks, but remain well below the same period last year. 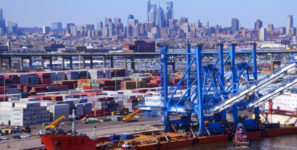 Container shipments from Asia to the US East and Gulf coasts grew by a stellar 7.9 percent in 2017, far outpacing imports to the West Coast, which mustered a meager 1.3 percent uplift, according to data from PIERS. The mismatch in the growth rates saw the East/Gulf ports increase their share of the market to 34.4 percent, up from 33 percent in 2016. The shift in the coastal balance eastward has been a constant trend in the past five years, but having slowed in 2016 it reasserted itself last year following the expansion of the Panama Canal mid-2016 that spurred lines to upgrade ships on that route. The 7.9 percent rise in imports to either East or Gulf ports seen last year dwarfed the 4.4 percent hike of 2016. The immediate outlook for US West Coast ports, which have lost approximately seven points market share over the past six years, is not promising and they are unlikely to be able to arrest the decline anytime soon, although with a large gateway market on their doorstep they should be able to keep the lion’s share of traffic for a number of years yet. Combined flows from Asia to all US coasts surpassed 15 million TEU last year, rising by 3.5 percent against 2016. When data for the faster growing Canada and Mexico markets becomes available we expect the annual rate for the total eastbound Transpacific to inflate to just shy of six percent. For this year, we expect headhaul transpacific volumes to increase again, but at a slightly lower rate of around 4.5 percent with East and Gulf coasts taking further bites out of the West coast’s dominance.